The classic dessert has been given an adult makeover. 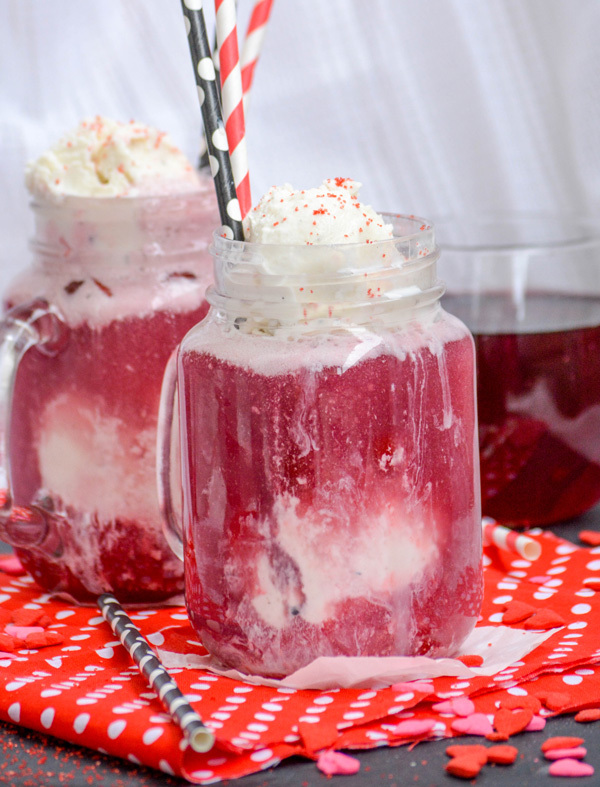 Generous scoops of vanilla ice cream and sweet maraschino cherries swim in a glass full of sparkling red wine- these Red Wine Ice Cream Floats are just what the doctor ordered after a long hard day. Everybody’s on the Valentine train and, I’m not gonna lie, so am I as I sit here assembling little goodie bags for my boys to wake up to in the morning. Nothing big, just some assorted candies to wake up to in the morning. And I always throw in a short, but sweet message for each kid. I want them to know I love them, and while I totally realize it’s a commercial holiday– a little something sweet never hurt to add to any day. My boys know I will never be the mom who gives you anew iPhone for a made up holiday, or the one who buys you a heart-shaped box of Ferraro Rocher. Even though those are totally delicious, and one of the sons’ favorites. That being said, once we’ve done a little something sweet for the kids– the hubs and I don’t mind doing a lil somethin’ sweet for ourselves. Watching a new episode of one of our favorite shows and enjoying some sweet, sparkling wine is totally our style. A nice, relaxing low-key evening. Oh, you enjoy a glass of chilled sweet wine too? What if I told you that you could add ice cream to it, and make it a truly dreamy dessert cocktail? Remember those ice cream floats you enjoyed as a kid? Welcome to adulting. 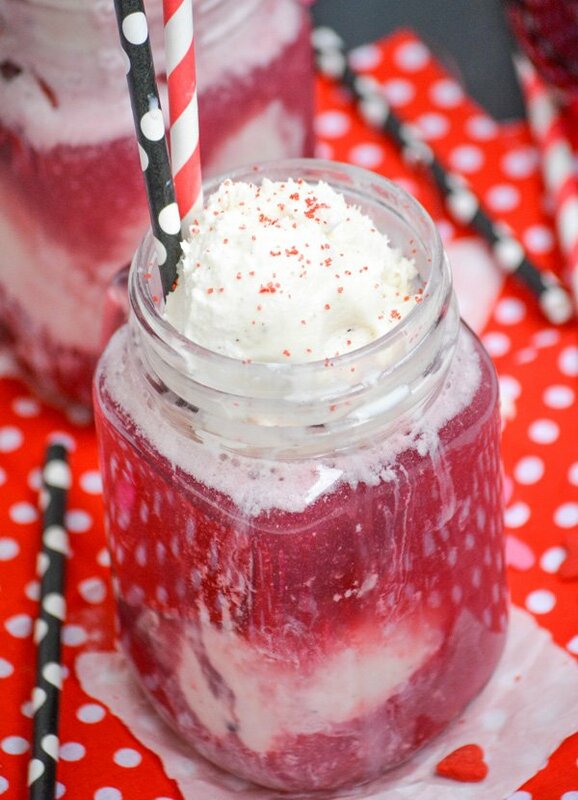 Now let me introduce you to Red Wine Ice Cream Floats. A Gift from the parenthood gods. 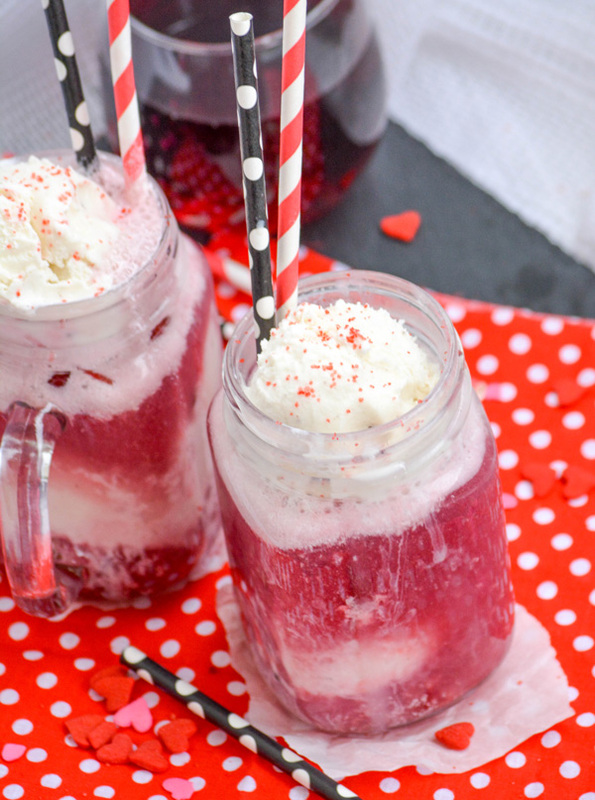 If you love dessert, and you’re a member of the wine sippin’ club, these Red Wine Ice Cream Floats are just the thing to float your boat. 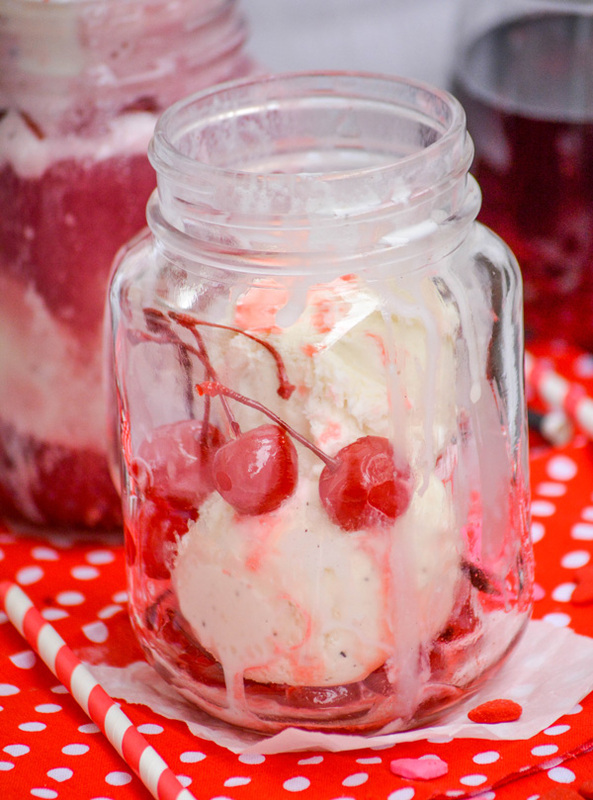 Scoops of creamy vanilla ice cream, maraschino cherries, and your favorite sparkling red wine combine to create a relaxing dessert that is just perfection. 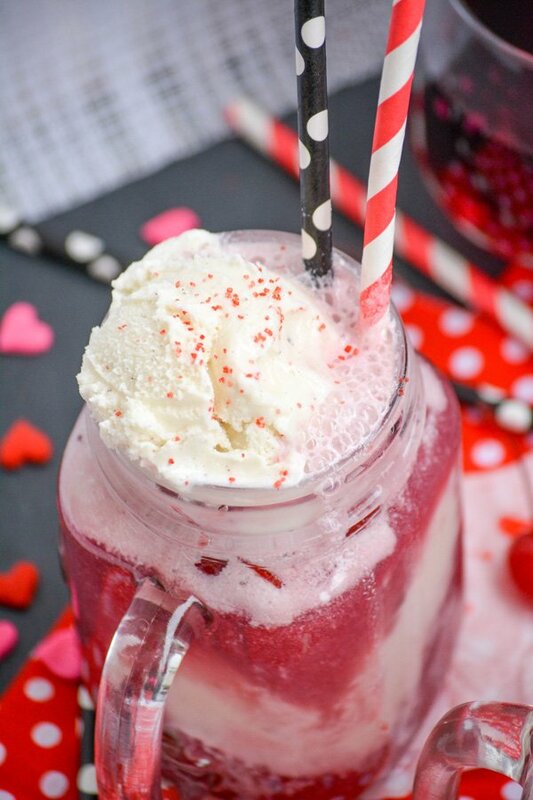 Put the kids to bed, and have a little ‘you’ time– Valentine’s Day, you had a hard day?, you got up today– they’re an allllll inclusive dessert drink. P.S. they’re even better when you share. A yummy wine infused adult twist on an iconic childhood dessert. Let the ice cream soften. Scoop several generous scoops of ice cream up. About three per glass. Return the container to the freezer and allow the scoops to firm up. Add about 3-4 maraschino cherries to the bottom of a large glass. Add two large scoops of the ice cream to the glass. Top the ice cream with 3 more cherries. Fill the glass up with red wine about an inch from the top. Stick a straw in the drink and top with another scoop of ice cream. If you want a bit of fun color, sprinkle with red sugar sprinkles.